A farmhouse immersed in the Bolognese countryside, close to the right bank of the Reno river, that serves a seasonal menu including starter, a pair of first courses, a pair of main courses with sides, fruit and dessert. The dishes are cooked to order, in homemade style, to make the flavour of the genuine ingredients stand out. Fresh pasta is hand made and rolled out with the rolling pin. 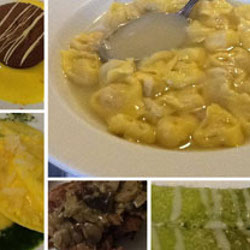 Among the first courses is possible to taste: tortellini in traditional capon broth, balanzoni (kind of tortelli), cordonetti pasta with sauce, tortelloni filled with ricotta or pumpkin, tagliolini pasta with mushrooms, pumpkin gnocchi, lasagne. The main courses menu vary among stuffed duck, hunter's style cockerel, ram stew, braised "scottona" beef, oven-roasted shank of pork, prosciutto en croute, air-cured pork meat with balsamic vinegar and "tagliata" beef. The dessert list includes: crème caramel, zuppa inglese, fior di latte, assorted biscuits, tarts. The farmhouse also breeds hens, guinea-fowls, capons, cockerels, ducks, turkeys, rabbits, pigs, sheeps and bovines.